Do you like the humorous title to my post? There's a funny story behind it. We finally got hit with some significant snowfall here in Wisconsin, followed by the Polar Vortex. Hubby went to work as usual, leaving our very long, long, driveway packed with snow. Our sweet, 80+ neighbor came and plowed our driveway out in the bitter cold. It was such a blessing because we don't own a plow and hubby would have had to hand shovel it in -30 temperatures after working a 12 hour day at work plus a one hour commute. So, my husband bought a gift card to our neighbor's favorite restaurant and asked me to make a Thank You card for him. 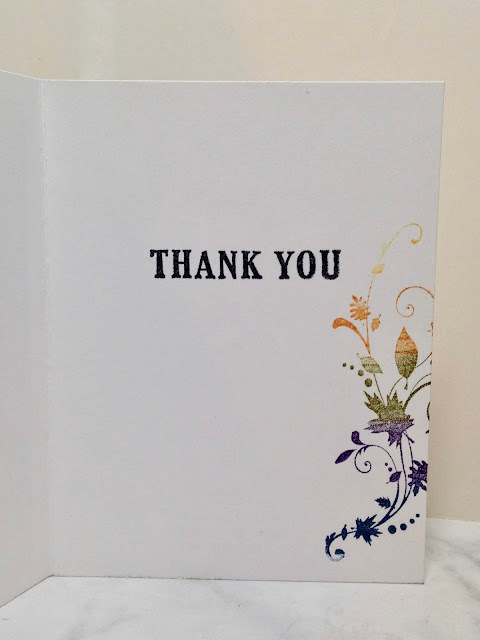 I already had Thank You cards in my stash, but when I showed them to him he rejected them all because they were "too girly". So back to the craft room I went to create this more "Manly" Thank You Card. I used my Deer Die set from MFT. I just love this die! 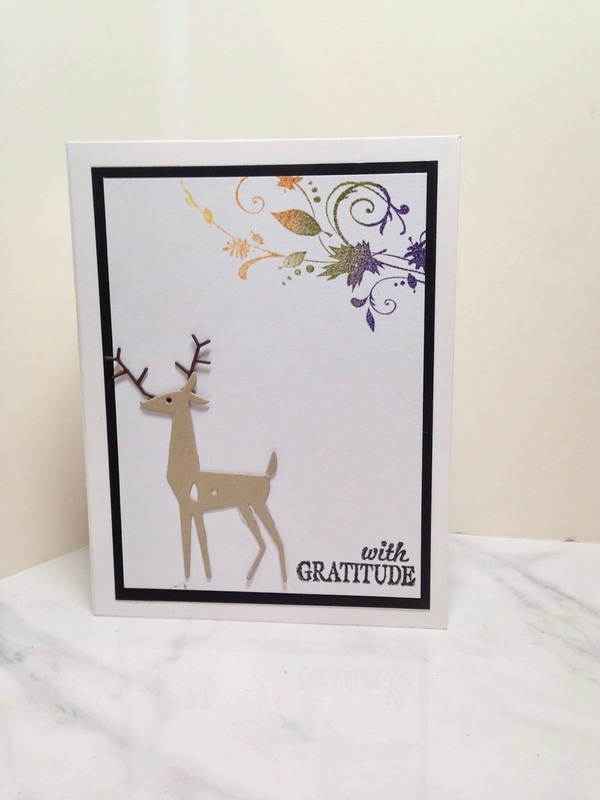 The deer are so sweet, and I think it works for both feminine and masculine cards. 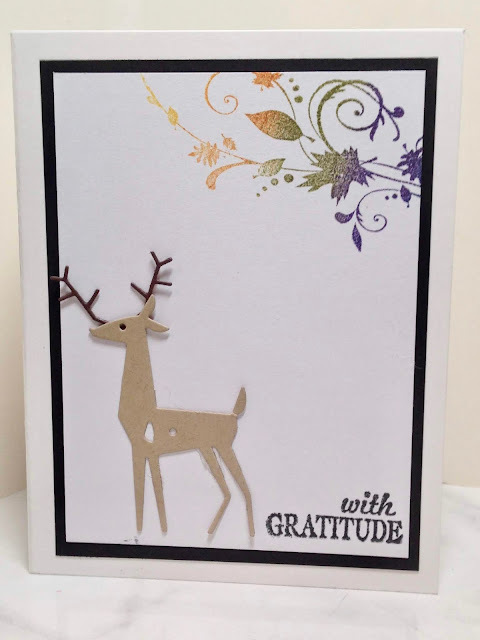 Because I had limited time, I kept the card very clean and simple by just stamping a foliage image in the corner and adding a sentiment. For the inside a stamped another sentiment and repeated the same foliage image in the corner. Isn't this deer just the cutest? I just love him! I don't buy a lot of dies as they are very expensive and I own a Circuit machine, but this one I knew I'd get a lot of use out of. I live in "Hunter's Country". We have the most and largest bucks in the state here and almost all the men I know hunt, so I knew this die would come in handy. If you're wondering how I got all the different colors on the leafy image, I stamped onto a Spectrum stamp pad. Easy peasy! That was really nice of your neighbor and the card is perfect! I love that deer! My husband had to work during the Polar Vortex too, I was worried but he said he was mostly on the train anyways (railroad worker). We were lucky we didn't get any extra snow during those days. I did experience my first "frost quake" during the coldest night ... have never even heard about them before. Nothing like being up all night thinking the windows are going to pop out of their frames or the ceiling is going to collaps on the coldest day ever! More ice for us this week...will it ever end!! That's so funny you mention "frost Quake" because I heard so many odd noises like you described and I wasn't sure what it was. Totally agree- the deer is the cutest! Love this! 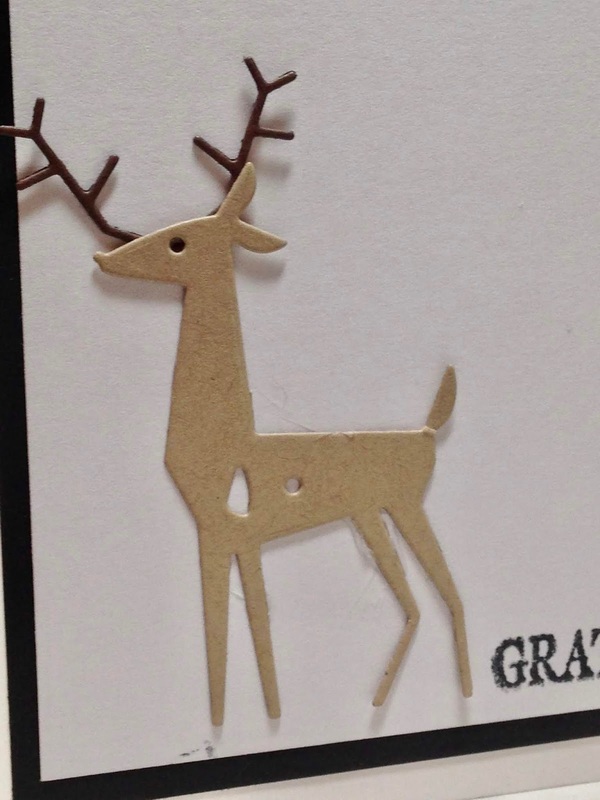 The deer is perfect, and it is a totally "manly" card. :) Thanks for sharing at Sweet Inspiration!